A while back I told you about the Receptionist at Everything Summer Camp, Missy. Missy is the first person you see when you walk into our Main Building. Warm, and incredibly friendly, Missy is always there to help. Aside from answering business calls, Missy also handles endless spreadsheets of important Web information as well as all of our sales reports, and much more. I could go on and on about Missy’s hard work, but today, I’m telling you about Missy’s favorite product that you can find right here at Everything Summer Camp. 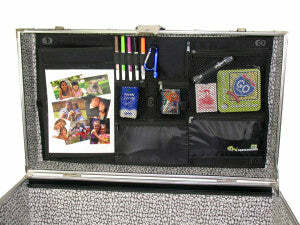 Drumroll, please… It’s the LidMate Organizer! At Missy’s household, the LidMate Organizer is kid tested, mother approved. “All the pockets work very nicely to store stuff in all sorts of sizes—that’s what my kids say anyway!” Missy says with a big laugh. The LidMate Organizer is one product that literally provides more storage space within a footlocker. See, it gets mounted securely on the inside of your trunk lid (hence the name) and lets you take advantage of every square inch that your camp tru nk has to offer! Without the LidMate Organizer, the inside surface of your footlocker lid is completely unusable. The center of the LidMate holds a metal, carabiner style light to shine on the contents of your trunk—no flashlight necessary! Featuring five turn buckles, seven zippered pockets, a mirror, and a clear pocket to display pictures from home, the LidMate knows how to make the most of your footlocker trunk! When Missy’s kids are happy, she’s happy too; so that makes the LidMate Organizer her favorite product here at Everything Summer Camp. Are you utilizing the maximum amount of storage space that your trunk has to offer like Missy’s kids are? That’s all for today, Readers. Till next time!